Leviton offers a complete selection of wallplates in multiple configurations to suit any need. Choose from three sizes: standard, midway and jumbo. Midway and jumbo versions are ideal for covering wall imperfections. Mix and Match QuickPort<sup></sup> Snap-In Audio/Video Adapters and connectors to create a customized multimedia center. Stereo/Video connectivity fo workstation cabling for termination on UTP cable, speaker wire or shielded audio/video cable. Mix and Match QuickPort<sup></sup> Snap-In Audio/Video Adapters and connectors to create a customized multimedia center. Stereo/Video connectivity for workstation cabling for termination on UTP cable, speaker wire or shielded audio/video cable. 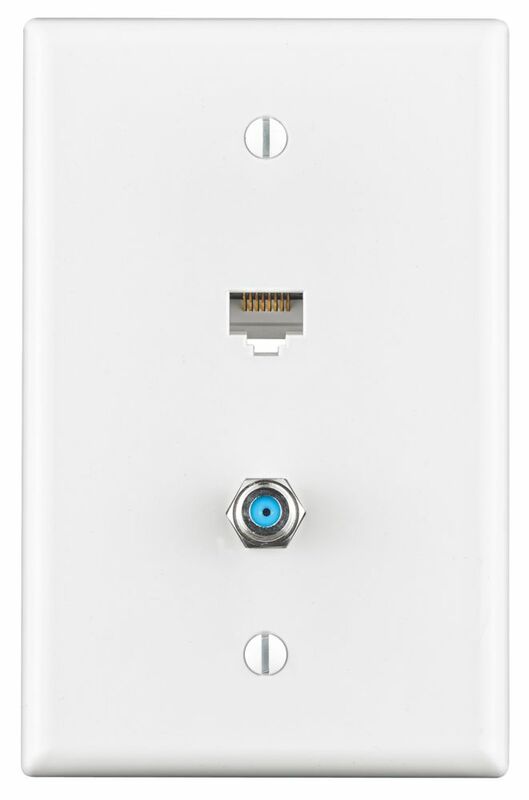 Leviton Wallplates are designed for use with Leviton devices. They represent styles and form factors that have stood the test of time. Their clean lines work in virtually any location,whether in new or retrofit construction, and they install quickly and easily. Combination Cat 5e Data/Cable Midsize Wallplate Leviton offers a complete selection of wallplates in multiple configurations to suit any need. Choose from three sizes: standard, midway and jumbo. Midway and jumbo versions are ideal for covering wall imperfections.